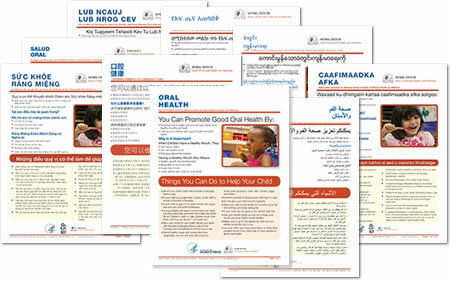 All brochures are written in an easy-to-read style that is appropriate for all audiences, including those with lower literacy levels. Permission statements to download, print or photocopy appear on each brochure. 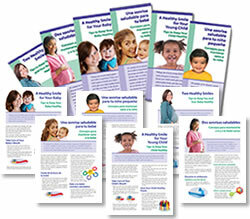 These brochures are designed to provide parents with information about the importance of oral hygiene and oral health care during pregnancy and after their infant is born and how to ensure that their infant or young child enjoys the best possible oral health. Consumer brochures are available in two formats: trifold and full-page (double-sided), choose the format that will work best. Amharic, Arabic, Armenian, Burmese, Chinese, Hmong, Marshallese, Polish, Somali, Spanish, Vietnamese, and Yiddish. Arabic, Chinese, Chuukese, German, Korean, Portuguese, Russian, Samoan, Spanish, and Vietnamese.